An Egypt-Dominican archaeological team which excavates a dig to look for the tombs of Cleopatra and Marc Antony has made important findings, said Friday doctor Kathleen Martinez, the Dominican embassy's Cultural attaché in that Arab country and the group’s leader. More than a million people have now seen the Tutankhamun exhibition at the O2 Centre, a popular success that, although it has made fewer headlines, matches Tut's first extravaganza in the 1970s, which packed out the British Museum for six months (tickets 50p) and criss-crossed America for three years. Its triumphant progress then (twice the number of people saw it at Seattle Art Museum as were living in Seattle at the time, for instance) earned the Egyptian Government a tidy sum by the standards of the day - $7million on the American leg alone - which was officially earmarked for a revamp of the display facilities at the treasures' permanent home, the Egyptian Museum in Cairo. Thirty years on, it's hard to think any of the money actually reached its destination. In fact it's hard to think of change of any sort disturbing the dusty, eternal dreams of the Egyptian Museum for large stretches of the last century. This incredible building offers many delights, not least the world's most magnificent collection of pharaonic art, but display facilities are not obviously one of them. Captions, wall panels, organisation by themes – all but none of the trappings of the modern museum corral the contents of its vast halls and atrium modelled on the interior of an Ancient Egyptian temple. Instead, its vast mother lode of splendours mutely await discovery, like Ancient Egypt itself, one of the best documented and, at the same time, most enigmatic civilisations in history. Artist's impression of the proposed Grand Egyptian Museum next to the Pyramids. All this may soon be about to change. A new museum, the Grand Egyptian Museum, is due at any moment to be built on a 100-acre site next to the Pyramids. The two ancient Egyptian objects were saved for the nation when the Supreme Council of Antiquities (SCA) succeeded in halting their sale in London and Amsterdam respectively as part of its campaign to stamp out the trade in illegally-smuggled artefacts. The first object, which was listed for sale at Bonham's auction hall in London, is an inscribed limestone relief that was chopped off the tomb wall of the 26th-Dynasty nobleman Mutirdis. . . . The relief appeared in Bonham's sale catalogue two weeks ago, and Hawass immediately wrote to the auction house requesting that the sale be stopped as the relief had been stolen and smuggled out of Egypt. In the second case, a green 19th-Dynasty ushabti figure of a woman named Hener was removed from sale by auction with the help of Egypt's ambassador to Holland. More re the announcement by Zahi Hawass that an anonymous mummy is going to undergo DNA testing with a view to determining if it is Tuthmosis I. A mummy found at the Valley of the Kings in Luxor might belong to Tohotmos I (1525 -1516 BC), father of Queen Hatshepsut of ancient Egypt, says the chief of the Supreme Council of Antiquities Zahi Hawwas. Discovered outside the tomb of King Seti II during the last century, the mummy will be moved to the Egyptian Museum to undergo examination, Hawwas announced Thursday 29/5/2008. An Egyptian archeological team will run DNA tests and CT scans to know for sure if it is the mummy of Tohotmos I. The remains of two other mummies will also arrive at the Egyptian Museum Friday 30/5/2008. The mummies, which belong to two women, had been discovered by Italian archeologist Giovanni Battista Belzoni in 1817. Destroyed in the 19th century, the remnants of the two mummies were collected in coffins to move them to the museum with what is believed to be Tohotmos I Mummy. All this is done as part of a mummy study project that the SCA initiated. Secretary-General of the Supreme Council of Antiquities Zahi Hawwas inspected on Thursday three mummies found in Qirna area, west of Luxor city. The mummies are due to be ferried to Cairo Friday to be thoroughly examined and to know if they have relations with Pharaonic kings and queens, amidst expectations that one of the mummies is royal. Hawwas inspected two more mummies inside Amenhotep tomb. The inspection was filmed by the cameraman of a foreign TV channel that accompanied Hawwas. Egypt's Supreme Council of Antiquities launched a campaign in cooperation with some Arab, Asian and European states to restore the prominent antiquities that were taken illegally from said countries. Secretary General of the Supreme Council of Antiquities Zahi Hawwas said that the council will invite a number of Arab and foreign countries including Palestine, Iraq, Mexico, Italy and Greece to convene under the UNESCO in order to discuss this issue and define the most prominent antiquities. Egypt will submit a proposal for UNESCO to restore the Egyptian antiquities in other museums, Hawwas added. It is a long walk through the alleys of Khan Al-Khalili and Gammaliya to reach Wekalet Al-Maghrabi. On a sunny day the area is buzzing with tourists and street vendors, and this was just another routine day, nothing unusual. On one of the narrow streets of Wekalet Al-Maghrabi, however, a new mood had been growing. There, at 14 Wekalet Al-Maghrabi, stands the house of Farouk Abdel-Aal, which has been rebuilt and rehabilitated by the RehabiMed project sponsored by the European Union. It was not only Abdel-Aal's house that was in need of urgent renovation to prevent imminent collapse. Twenty workshops specialising in producing metalwork such as plates and other household items were also in a state of deterioration. All were renovated and rehabilitated by the project. . . .
Wekalet Ahmed Al-Khatib, recently named Al-Maghrabi, includes four small industrial and traditional crafts for metal turning, metal washing and painting, manufacturing brushes and hand decorated brass. The wekala was constructed in the 18th century, and Ottoman architectural features are clearly visible. Shops and markets have always been a main feature of this relatively poor area, where urban development is slow. Exhibition: Coptic fabrics on display in Florida, U.S. Unlike any other gallery or museum in the area, Ybor's Brad Cooper Gallery takes a foray into the fiber arts of the ancient world with an exhibit of Coptic textiles curated by Egyptologist Dr. Robert Bianchi. The roughly 20 woven fragments on display, which date to 400-800 A.D., offer a deep historical context for the mostly contemporary weavings on view in other local exhibitions. To be sure, the ancient Egyptians were proficient weavers of plain flax long before the cotton and wool weavings of the Coptic period were produced, but these cryptic relics -- characterized by intricate patterns, color and human and animal figures -- mark an evolutionary jump in the complexity of the craft. The Copts, early Christians native to Egypt, were a multicultural group, steeped in classical Greek culture -- not only its mythology but the Greek practice of dyeing, spinning and weaving with wool and cotton fiber -- as well as emerging Christian iconography. See the above page for more (it begins several paragraphs down this review of different fabric exhibitions in the area). There's a press release in PDF format on the gallery's website. Minister of Culture Farouk Hosni is no stranger to criticism. For over 20 years he has been among the most controversial cabinet ministers, frequently locked in feuds with the National Democratic Party (NDP) and Islamist politicians as well as left-wing intellectuals. But in what is perhaps the fiercest campaign against him to date, last week Hosni was accused by Israeli newspapers of upping the ante in increased diplomatic tension between Egypt and Israel after being quoted as saying he would burn Israeli books himself if he found any in libraries in Egypt. The remark could, as some suggest, thwart his bid to become the head of UNESCO. The next few days are going to feature some photos from the Temple of Luxor. Most of my photos of this temple are actually in Luxor, for some reason, but I will be collecting those next week (I'll be going up to north Wales on the 5th, back on the 10th but I'll post a reminder that the blog won't be updated for those days nearer the time). As the first two photographs show, it has a mosque (Abu Haggag) built into the side of it, which shows the ground level prior to the excavation of the temple. The mosque can now be reached from the road side. Last year there was quite a lot of publicity when part of the Pharaonic temple was revealed behind part of the mosque - there's a summary of the find (dating to Ramesses II) on the National Geographic website. Egypt plans to conduct a DNA test on a 3,500-year-old mummy to determine whether it belongs to King Thutmose I, one of the most famous Pharoahs, the country's chief archaeologist said Thursday. Zahi Hawass, Egypt's antiquities chief, said the test will be carried out on an unidentified mummy found in the ancient Thebes on the west bank of the Nile, what is today Luxor's Valley of the Kings. Egyptian experts will also X-ray the mummy, Hawass was quoted as saying by the nation's Middle East News Agency. Hawass said a mummy currently on display in the Egyptian Museum that was purported for many years to have belonged to Thutmose I does not actually belong to him. . . .
Egypt has acquired a $5 million DNA lab, funded by the Discovery Channel, which has become a centerpiece of an ambitious plan to identify mummies and re-examine the royal mummy collection. . . .
Hawass had long refused to allow DNA testing on Egyptian mummies and only accepted it recently on condition it would only be done by Egyptian experts. He has never disclosed full results of the examinations, sometimes on grounds of national security. Though Hawass has never explained the reasons for this, apparently there is concern the tests could cast doubt on the Egyptian lineage of the mummies. Also on the Associated Press site. The crowds of pigeons, doves and sparrows that have been landing regularly on several parts of the Sphinx indicate that the level of humidity is dangerously increasing within the stone structure of the statue, senior tour guide Bassam El Shammaa warned. Visitors to the site have noticed birds settling on the statue’s head and the shaded northern part of the structure. Other birds sit in the shaded gaps that make up the Sphinx’s eyes and ears. Besides leaving behind acidic droppings, the birds also slowly eat into the fragile stone as they pick the tiny grains of sand. El Shammaa launched an on-line campaign last year called “Save the Sphinx,” in which he expanded on his theory that the rising groundwater levels endanger the monument, with water seeping into the stone and creating calcium deposits. It is these calcium deposits, he says, that are attracting increased numbers of birds. See the above page for the full story, with photograph. “It’s over there,” said Dave, “Somewhere.” I scanned the desert horizon. It was midday and the Egyptian landscape was flattened by the overhead sun. In a few minutes, maybe ten, we would be the first people ever to be at that specific point on the earth’s crust. 28N 31E to be precise. 28 00 00 N 31 00 00E to be very precise. There would be no distracting minutes and seconds, just the pure integers of latitude and longitude. The going got tougher, the desert surface gravelly and now stretching uphill. We were climbing up the humpy left side of a wadi, or dry riverbed. There was no vegetation visible anywhere in a 360 degree circle- I scanned hard but saw nothing except low dun grey hills and dry valleys. The only sight that drew the eye was a rock breaking the skyline. We had parked the 4×4 some way back and now I was out of breath, what with the heat and going uphill. Dave strode on manfully, pulling ahead. It was then I suspected, that like Hillary and Tenzing, only one of us would get to that sacred spot first. We both had GPS machines that checked our position but Dave’s was bigger, more authoritative. Plus he had a longer stride than me. It looked like I was about to assume the Tenzing position. We were only climbing a small hill not a mountain and we weren’t interested at all in the summit. What drew us on was the promise of bagging a confluence point. A confluence point is where a degree line of latitude and longitude meet like 50N 25W or where a whole lot of lines meet like the North or South poles. It has to be a whole number and on land or within sight of land. There are 14,029 out there. There are 11,396 still waiting to be bagged. And Dave and I were after 28N 31E , somewhere in the Egyptian desert between the Nile and the Red Sea. It's a slow news day, so forgive the slight side step from the specific (Egyptology) into the general (archaeology). I've been enjoying the various responses to the new Indiana Jones movie from many archaeologists who, whilst generally enjoying the whole series, are appalled by the chaotic image of archaeology that the scenes portray. This article contrasts the gung-ho approach of Indiana Jones to the fin-grained reality of archaeology as it is actually carried out today. It also raises concerns about looting. When Indiana Jones managed to retrieve the trinket he was after in the opening moments of "Raiders of the Lost Ark," he pretty much wrecked everything else in the ancient South American temple. Though he preaches good science in the classroom, the world's most famous archaeologist often is an acquisitive tomb raider in the field with a scorched-earth policy about what he leaves behind. While actual archaeologists like the guy, they wouldn't necessarily want to work alongside him on a dig. Real experts in antiquities acknowledge that the movies are pure fiction. Still, they cringe at the way Indy manhandles the ancient world. "There are codes of ethics in archaeology, and I don't think he would be a member. Not in good standing, anyway," said Mark Rose, online editorial director for the Archaeological Institute of America. In a career spanning 27 years and four films, Indy has been both a blessing and curse for the musty world of archaeology, fanning interest in the field beyond academic circles but doing a Hollywood number on how the job actually works. In 1989's "Indiana Jones and the Last Crusade," nerdy Professor Henry Jones Jr. tells students that 70 percent of archaeology is done in the library and advises them to "forget any ideas you've got about lost cities, exotic travel and digging up the world. We do not follow maps to buried treasure, and 'X' never, ever marks the spot." Then he puts on his fedora, smashes through crypts, kills scores of Nazis and desecrates a grave by using a human leg bone as a torch. And, in one scene, "X" really does mark the spot. The reality of archaeological field work involves large groups of workers painstakingly sifting through grids to retrieve artifacts as mundane as pottery fragments. Fred Sierevogel sent me this photograph and asked me to identify it, but I'm afraid I cannot be of much help. 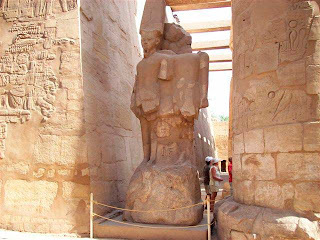 The statue is located in the Great Hypostyle Hall of Karnak and shows the deity Amun accompanied by a second figure whose head is missing. 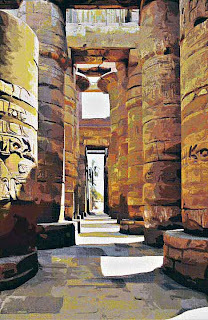 I cannot find out if the statue is contemporary with the Hypostyle Hall or was placed there at a later stage. Nor can I find out for sure if there are any inscriptions on it. I've looked at all my books and had a hunt around the web but I've found nothing conclusive. It is all too easy to eat up the hours trying to find out this sort of information! If anyone has any useful information on the subject I'll update this post. I really need to get back to Luxor in the next year or so and spend some serious time at Karnak! Egyptian archaeologists have discovered what they say was the ancient headquarters of the Pharaonic army guarding the northeastern borders of Egypt for more than 1,500 years, the government said on Wednesday. The fortress and adjoining town, which they identify with the ancient place name Tharu, lies in the Sinai peninsula about 3 km (2 miles) northeast of the modern town of Qantara, Egyptian archaeologist Mohamed Abdel Maksoud told Reuters. The town sat at the start of a military road joining the Nile Valley to the Levant, parts of which were under Egyptian control for much of the period, the government's Supreme Council for Antiquities said in a statement. The archaeologists, led by Abdel Maksoud, have been working on forts along the road since 1986 but it was inscriptions found this year which clinched the identification, he said. The inscriptions mention three Pharaohs -- Tuthmosis II, who ruled from about 1512 BC and who built one of the military installations along the route, Seti I and Ramses II, who between them ruled Egypt from 1318 to 1237 BC, it added. The site contains the remains of a mud-brick fortress dating from the time of Ramses II and measuring 500 metres (547 yards) by 250 metres, with towers four metres high, it said. The ancient military road, known as "Way of Horus," once connected Egypt to Palestine and is close to present-day Rafah, which borders the Palestinian territory of Gaza. Archaeologist Mohammed Abdel-Maqsoud, chief of the excavation team, said the discovery was part of a joint project with the Culture Ministry that started in 1986 to find fortresses along that military road. Abdel-Maqsoud said the mission also located the first ever New Kingdom temple to be found in northern Sinai, which earlier studies indicated was built on top of an 18th Dynasty fort (1569-1315 B.C.). A collection of reliefs belonging to King Ramses II and King Seti I (1314-1304 B.C.) were also unearthed with rows of warehouses used by the ancient Egyptian army during the New Kingdom era to store wheat and weapons, he said. An undated picture released by the Supreme Council for Antiquities on May 28, shows a carving of the ancient Egyptian sky-god Horus dating from the reign of Egypt's well known pharaoh Rameses II (ca. 1279-1213 BC) discovered in a temple dedicated to Horus located in the largest military complex excavated in the ancient 18th-19th Dynasty city of Saro in North Sinai. An ancient Egyptian inscription which was found in what archaeologists believe is the fortress town of Tharu in northern Sinai, is seen in this undated handout photo made available May 28, 2008. I met Ruwais St Anthony in 2006 - and as well as being a very good communciator he is certainly gregarious. The monastery is an amazing place. Tour guides are not permitted to explain the monastery and this is a job that the designated monks carry out very effectively. If you are visiting St Anthony's Monastery you should make sure to visit The Monastery of St Paul at the same time - it is quite near and it has a very different feel to it. A speck of green in a sea of sand, St. Anthony's Monastery in Egypt welcomes those seeking God in silence broken only by the whisper of the wind. Monks at what is considered by many to be the world's oldest active Christian monastery still rise before dawn to chant and pray just as their predecessors did for more than 1,500 years. Now, they also carry mobile phones, send e-mails and maintain a website (http://www.stanthonymonastery.org), embracing modernity that has helped sustain the ancient monastery, nestled beside a spring where Egypt's eastern desert meets the craggy Red Sea mountains. But the changes have sent some monks fleeing to a more austere existence in nearby mountain caves. "There is nothing wrong with microwaves or mobile phones -- they save time," Egyptian monk Ruwais el-Anthony, who has lived at the monastery for more than 30 years, said through a bushy white beard. "But God will ask you what you have done with the time that was saved." The monastery, which was founded in 356 AD, has survived Bedouin raids, the Islamic conquest of Egypt, and wars between Egypt and Israel that turned the area into a combat zone. Almost all the monks here are Egyptian Coptic Christians, a minority faith in the most populous Arab country, which is about 90 percent Muslim. Most Christians in Egypt belong to the Coptic Orthodox church, which gives allegiance to its own Pope in Egypt, Shenouda III. Once closed off from marauding Bedouins behind towering white stone walls, the monks now open iron doors, engraved with Coptic writing, to busloads of tourists and pilgrims. The monks raise chickens, grow fruit, and lead tour groups through the compound's 15th century church, which is built above the oldest monk cells ever discovered, dating from the fourth century, the monks say. Monks believe a recently discovered grave under the church is that of St. Anthony himself. "When I came here, it was very primitive and totally isolated," monk Athansious el-Anthony, 62, said. When he first arrived in the late 1960s, the only visitors were Egyptian soldiers demanding water during Egypt's war with Israel. The monastery was near the front-lines of fighting in the war, which began in 1967. Now, a new road through the desert brings busloads of visitors, most from Europe and Russia. Only the most gregarious of the 120 monks at St. Anthony's deal with visitors. The others isolate themselves in their rooms or spend their days praying in the caves. These photographs were sent to me by Ben Morales-Correa. The first is one of mine and the second is one that he took, copied from his All About Egypt site - both have been manipulated to look like artwork in Photoshop. Really good fun. Thanks Ben! It is nice to have something a bit different to post. There have been various bits of news trickling out of Egypt about underwater discoveries in the Nile at Aswan. Here's the latest. Archaeologists have discovered a portico, or covered entryway, of an ancient Egyptian temple beneath the surface of the Nile River. The entryway once led to the temple of the ram-headed fertility god Khnum, experts say. A team of Egyptian archaeologist-divers found the portico in Aswan while conducting the first-ever underwater surveys of the Nile, which began earlier this year. "The Nile has shifted, and this part of the temple began to be a part of [the river]," said Zahi Hawass, Secretary General of Egypt's Supreme Council of Antiquities. . . .
Today's Nile obscures many objects from ancient times, and archaeologists believe the underwater excavations will reveal other significant artifacts. The massive portico is too large to be removed during the current excavation, but archaeologists removed a one-ton stone with inscriptions that could date from the 22nd dynasty (945-712 B.C.) to 26th dynasty (664-525 B.C.). The stone itself could be much older, however, because like many objects throughout Egyptian history, the original materials of the Temple of Khnum were reused to construct newer buildings. See the above page for the full story, which is accompanied by a photograph of the one-ton stone with its inscriptions. James Cuno's new book has generated a lot of interest in the media and on individual blogs. He has published this book at a good time, when issues of repatriation and the ownership of heritage are very much in the forefront of discussions amongst those concerned with the management of art and heritage collections. If you need a username and password for this article enter "egyptnews" in both fields. It has, like much material property in the last 50 years, often changed hands. And in doing so, it has also changed meanings and grown in importance. It now affects the development of museums, alters the nature of international commerce and even seems to subsume traditional notions of property. It was brought to modern prominence in 1954 by Unesco as a way of characterizing the special status of monuments, houses of worship and works of art — objects that suffered “grave damage” in “recent armed conflicts.” In its statement Unesco asserted that such “cultural property” was part of the “cultural heritage of all mankind” and deserved special protection. But the framers of that doctrine with its universalist stance would hardly recognize cultural property in its current guise. The concept is now being narrowly applied to assert possession, not to affirm value. It is used to stake claims on objects in museums, to prevent them from being displayed and to control the international trade of antiquities. It is critically surveyed in an illuminating new book, “Who Owns Antiquity? Museums and the Battle Over Our Ancient Heritage” (Princeton) by James Cuno, the director of the Art Institute of Chicago and former director of the Harvard University Art Museums. The idea is as troubling as Mr. Cuno suggests. If you are interested in this topic, David Gill keeps tabs on heritage ownership news and issues on his Looting Matters blog. The 3,200-year-old massive statue of Ramses II remains in a protective shed in Cairo on May 26. After years of controversy, based on worries that heavy pollution was damaging the statue, the 83-tonne, 11-meter high pink granite colossus was moved on August 25, 2006 in a ten-hour operation using two flatbed trucks through the city after standing for 50 years in a downtown Cairo square, hemmed in by bridges, an underground railway and a mosque, to stand closer to its original location in Giza, near the pyramids plateau, just south of the Egyptian capital. Pierre Vidal-Naquet, The Atlantis Story: A Short History of Plato's Myth. Translated by Janet Lloyd. Exeter: University of Exeter Press, 2007. We live in a time of parallel historical 'realities,' or perhaps more properly, mentalities: those constructions and parameters within which the scholarly community generally operates, and those of popular culture. Although these occasionally may wave to each other in the distance as they pass on the highway, in many cases they exist in conceptually opposite corners, swords drawn in active hostility. The phenomenon of this alienation between scholars and the general public, in which each side battles to own or control the categories proof, evidence, objectivity, critical distance, the scientific method and scholarly authority, has been examined in several studies over the last ten years or so, yielding fascinating analyses of various controversies, including the publication of the Dead Sea Scrolls, the archaeology of Palestine-Israel-Jordan, the real existence of Noah's Ark, the split between mainstream Egyptology and certain elements of Mormonism, the biography of the Pharaoh Akhenaten, and of course anything and everything mentioned in The DaVinci Code. The book Women on the Nile: The Writings of Harriet Martineau, Florence Nightingale and Amelia Edwards, by Professor Joan Rees (Rubicon Press), has been announced by Stacey International. It will be launched by the Friends of the Petrie at the Institute of Archaeology, UCL (London, UK), on 27th June 2009, 1930-2030. For those interested in attending the full address for the Institute is 31 Gordon Square London WC1H 0PY. By combining extracts from their most famous works with Rees' insightful essays, Women on the Nile illuminates the life and writings of three remarkable women and captures something of the romance of 19th century travel to the East. Harriet Martineau was a doughty and influential campaigner for multiple social causes; Florence Nightingale became a universally acclaimed reformer of nursing and hospital practices; Amelia Edwards, formerly a novelist and prolific professional writer, returned from Egypt to found the Egypt Exploration Society and endow the first Chair of Egyptology at a British University. All three were independent minded women of strong character and exceptional gifts. 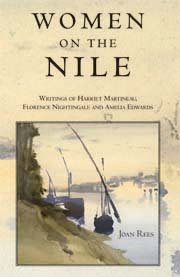 They were accomplished writers each with a distinctive style, and their accounts of their Nile journeys are richly individual and full of life, thought and observation. The New Kingdom is something of a black hole in the Faiyum. During the Middle Kingdom and the First Intermediate Period the Faiyum's vast lake was at around 20m above sea level but research has suggested that for a 200 period between 3100 and 2900BP the lake reached lows of 10m below sea level (Fekri Hassan 1986 - let me know if you want the reference). Perhaps the Faiyum was simply factored out of Egyptian economic thinking until the Ptolemaic period. During the periods preceding the arrival of Alexander the Great in 332 BC, the Fayum was most prominent in the Middle Kingdom (2025-1700 BC). In the Ptolemaic Period, the Fayum was one of the main regions where Greeks settled. The Ptolemies founded a number of towns around the Fayum lake. Although some of them are of considerable size, none of them had the administrative status of a city (polis). These sites continued to flourish into the mid and late first millennium AD. They are often well preserved (including organic material such as wood and papyrus), and therefore they are an important source for settlement plans and architecture, and daily life objects, especially of the late Roman and Byzantine Periods. However, many of these sites were excavated by researchers hunting exclusively for papyri; little attention was paid to other finds. Crocodilopolis or Krokodilopolis (Greek: Κροκοδείλων πόλις) or Ptolemais Euergetis or Arsinoe (Greek: Ἀρσινόη) was an ancient city in the Heptanomis, Egypt, the capital of Arsinoites nome, on the western bank of the Nile, between the river and the Lake Moeris, southwest of Memphis, in lat. 29° N. Its native Ancient Egyptian name was Shedyet. In the Pharaonic era the city was the most significant center for the cult of Sobek, a crocodile-god. In consequence, the Greeks named it Crocodilopolis, "Crocodile City", from the particular reverence paid by its inhabitants to crocodiles. The city worshipped a "sacred" crocodile, named "Petsuchos", that was embellished with gold and gems. The crocodile lived in a special temple, with sand, a pond and food. When the Petsuchos died, it was replaced by another. After the city passed into the hands of the Ptolemies, the city was renamed Ptolemais Euergetis. The city was renamed Arsinoe by Ptolemy Philadelphus to honor Arsinoe II of Egypt, his sister and wife, during the 3rd century BCE. The Soknopaiou Nesos Project can be defined as a complex idea that developed in the years. At the beginning the only aim of the Joint Expedition was to document the site with modern topographical and archaeological techniques of survey. The archaeological area was surveyed in two seasons (2001 and 2002). A preliminary record of all the visible buildings was also done. Contemporary, other two different researches were begun, one relating the record and study of the Greek literary papyri coming from Soknopaiou Nesos and one on the bibliography and old images of the site. For this last research a great help came from the Kelsey Museum of Ann Arbor that provided us freely many photographs from its archive. The collection of the bibliography is still in progress and it will be a long task especially because of the great number of papyri published. In fact, we would like to realize in Lecce an archive on Soknopaiou Nesos both digital and on paper. As is well known, Soknopaiou Nesos is one of the most important source of information on the Graeco-roman society thanks to its excellent state of preservation and not only for the past findings of papyri. Still it is a very rich source of information for different scientific matter. For this reason we started to imagine a more complex enterprise that can involve scholars and specialists in an interdisciplinary and wide study. The town is spread out north and south and is mostly in ruins save for a few structures that are worth mentioning. The Roman bath is a mere outline on the ground as are most of the houses, but a few still sand, at least partially. Some even have fresco decorations on the interior walls. The most noteworthy of these is located just east of the Roman fortress. Thermal baths with frescoes were discovered here in 1948, but the desert has long since reclaimed them. This web site is an on-line version of the 1983 Kelsey Museum of Archaeology exhibition catalogue of the same name by Elaine K. Gazda. For the purposes of the electronic version, text has been abridged and some illustrations omitted; full text and illustrations can be found in the print version of the catalogue, which is still available for purchase from the Kelsey Museum of Archaeology (Go to Kelsey Museum Publications). Mummy portraits or Fayum mummy portraits (also Faiyum mummy portraits) is the modern term for a type of realistic painted portraits on wooden boards attached to Egyptian mummies from Roman Egypt. They belong to the tradition of panel painting, one of the most highly regarded forms of art in the Classical world. In fact, the Fayum portraits are the only large body of art from that tradition to have survived. Mummy portraits have been found in all parts of Egypt, but they are especially common in the Faiyum Basin, particularly from Hawara and Antinoopolis, hence the common name. "Faiyum Portraits" should therefore be thought of as a stylistic, rather than a geographic, description. While painted Cartonnage mummy cases date back to pharaonic times, the Faiyum mummy portraits were an innovation dating to the time of the Roman occupation of Egypt. They date to the Roman period, from the late 1st century BC or the early 1st century AD onwards. It is not clear when their production ended, but recent research suggests the middle of the 3rd century. I couldn't find anything very useful about the history of Coptic monasticism in the Faiyum - there are photographs and bits and pieces of information but nothing detailed. This seems surprising to me, as some very famous Coptic saints are said to have come from the Faiyum, and there is a long tradition of Coptic monasticism in the area. Reports for three seasons of survey and excavation in the Fayum by the UCLA, who run a field school for Egyptian archaeologists. This is seriously well worth a look if you want to get a feel for how this sort of field operation works. The seasons covered are 2002-2004 inclusive. In early September 2005, the Minister of Culture - Farouq Hosni, approved an LE 3 million Egyptian-Italian project to renovate and develop archaeological sites in the area of Medinet Madi, located in Gharaq Depression in the Faiyum. Dr. Zahi Hawass, Secretary-General of the Supreme Council of Antiquities said that further excavations would be conducted in the Temple Area, dating to the Middle Kingdom and Ptolemaic period. Hawass added that the aeolian sand presently covering the cemetery adjacent to the temple would be removed, and the whole site would be renovated. This project is expected to be completed within 12 months, and aims at providing the facilities required to put this area on the local and international tourist maps. The government has launched a development project of the Wadi al-Hitan (aka Wadi Zeuglodon or Whale Valley) Protectorate (nature reserve) in the Wadi Rayyan, Faiyum Governorate. The project aims at placing the area, newly inscribed on the UNESCO World Heritage List, on the eco-tourist map. It is uncertain what form the development of the northern shore of the Faiyum will take, but it is certain that watching briefs are essential for any development in the area. Consultation with archaeological bodies such as the EAIS, the SCA and CultNat are crucial if the destruction of major settlements such as Kom W are to be avoided. Tragically, it seems that it is already too late for some sites, such as Kom K, that are already in the midst of modern agricultural development projects. Moreover, the bringing of any tourists to the area puts not only the known sites at great risk, but may destroy evidence of sites which are yet to be discovered. Unless the tours are strictly managed and all the tourists are carefully briefed and monitored it could result in lithics and potsherds being removed (which is a criminal offense) by unsuspecting tourists who want a souvenir of their visit. Taking tourists to fragile sites in the Eastern and Western Deserts has resulted in appalling intentional vandalism as well as the careless and harmful handling of rock art. Rather than preserving the past, the opening up of the north shore of the Faiyum to eco-tourism may have the opposite of the desired effect, for it may destroy the very thing that the tourists want to see and archaeologists wish to preserve: the origins of one of the world’s earliest and greatest civilisations. Archaeologists and geographers at UCL got together with a GIS expert to recreate the lake levels of the Faiyum Depression over a long period of time. The Faiyum's lake was fed by a run-off of the Nile called the Bar Yusef. This means that the lake reflects the Nile's flood levels and its annual fluctuations. This is a super visual indication of the area which could have been settled and farmed in the Faiyum at different times. After undiluted Karnak for a week I thought I'd throw in some scenic shots of the Nile in Upper Egypt as it is today, as seen from the sundeck of a cruise ship. An alabaster head of Cleopatra and a mask thought to belong to her lover Mark Antony have been found near Egypt's Mediterranean city of Alexandria, antiquities chief Zahi Hawass said on Monday. The two treasures, a bronze statue of Goddess Aphrodite and a headless royal statue from the Ptolemaic dynasty, which ruled Egypt between 323 and 30 BC, were discovered by a joint Egyptian-Dominican Republic team of archeologists in the Tapsiris Magna temple, Hawass said. Some 20 bronze coins stamped with Cleopatra's face were found in underground tunnels 50 metres (164 feet) deep in the archeological site, Hawass said. The teams had originally been searching for Cleopatra's tomb but Hawass "categorically denied" that they were any closer to finding the queen's burial place. "We have found nothing that indicates the presence of the tomb," he said, adding that the search for the tombs will restart in November. Archaeologists from Egypt and the Dominican Republic have unearthed a bronze statue of the goddess Aphrodite and other artifacts during excavations at an ancient temple on Egypt's Mediterranean coast. Also among the finds were the alabaster head of a Queen Cleopatra statue, a mask believed to belong to Mark Anthony and a headless statue from the Ptolemic era. Taposiris Magna is an ancient town located on Lake Mariut which is today called Abusir, near the northern coastal city of Alexandria. For anyone unfamiliear with the site there's a feature about Taposiris Magna on the TourEgypt website, accompanied by a plan and photographs. A more detailed overview is provided in French by the Mission Francais des Fouilles de Taposiris Magna. A slideshow demonstrating how Sarah Parcak goes about finding ancient Egyptian sites using satellite photographs. I should warn you that the site was down over the weekend, and when it first came back up I was only able to access the first couple of slides - but it seems to be working normally at the moment. Well worth a look if you're interested in how sites are found. Lots of people live in Egypt. They always have. So how do you find ancient ruins when modern humans live and farm the land? Sarah Parcak of the University of Alabama at Birmingham uses images from a hyperspectral satellite, which has cameras that take pictures in various wavelengths. She sorts the data to reveal the high concentrations of organic matter and phosphorus content that mark ancient Egyptian house mounds. Then she gets a closer look and starts to dig. A Spanish team lead by archaeologist Myriam Seco have been granted the concession to excavate, record and restore the Temple of Tuthmosis III in Luxor, starting work in autumn 2008. Eventually the plan is to prepare the site so that it can be opened to visitors. Un equipo español dirigido por la arqueóloga Myriam Seco excavará a partir del próximo otoño el templo funerario del faraón Tutmosis III en Luxor, donde no se llevan a cabo trabajos desde los años sesenta, según informó a Efe la arqueóloga. La Academia de Bellas Artes Santa Isabel de Hungría de Sevilla ha recibido la concesión del Consejo Supremo de Antigüedades para este proyecto realizado con la colaboración de la Embajada de España y financiado por la empresa de hidrocarburos CEPSA. . . .
My round-up of Gilf Kebir websites was posted a couple of weeks back, but here's another site which may be of interest to anyone else who is interested in the background to exploration and survey in Egypt's Western Desert (with my thanks to Harry Robbins for sending me the link). The 1924 National Geographic article is particularly well worth the read. Hassenein Bey's excelelnt book The Lost Oases is now published by AUC. Ahmed Bey Hassanein―an Oxford-graduate Egyptian, grandson of the last Admiral of Egyptian fleet, son of Al-Azhar Professor, diplomat, Olympic champion, Photographer, Writer, King's tutor, politician and a world-famous legendary explorer of the 1920s. 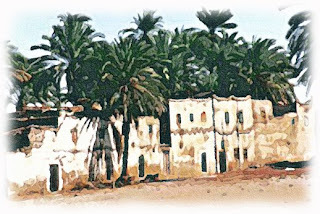 Those pages of SaharaSafaris.org are dedicated to information about his 1923 expedition in which he discovered Owenat in the Libyan Desert that brought him to fame and later a meteoric political career. You'll find here the only occurrence on the web of the article he wrote to National Geographic (American magazine) in September 1924 complete with 47 impressive photos of his that were scanned directly from the magazine itself (he had movies too). Not only is his accounts are funny, witty, and romantic, but is terribly exciting as well. (A pdf version good for printing could be downloaded here). The Faiyum is located around 80km to the southwest of Cairo, covering 12000km.sq. The depression is often described as an oasis, but it is not fed by artesian waters. It has a large lake which is supplied by the Bar Yusef, a run-off of the Nile which has fed the Faiyum depression for thousands of years. As the Nile and its floods have fluctuated, so have the lake levels, and depending on the technology available at the time, this has impacted how the Faiyum was occupied and exploited economically. The area has been used from prehisotric times onwards. In was used for quarrying of gypsum and basalt in the Old Kingdom when the world's oldest road was created. In the Middle Kingdom pyramids and temples were built here when the capital of Egypt was moved to the El Lisht vicinity. The first efforts to manage the water supply were made during the Middle Kingdom, and more sophisticated water management systems were introduced from the Ptolemaic period onwards. The Faiyum has an important Coptic history as well. I have had to split this post into two because of the amount of information available. For those of you who saw an earlier verison of this post I've sorted out the text colouring problem - edit the main text in Firefox and then when you want to standardize the colours go to Explorer. Sigh. The Wadi Al Hitan (Valley of Whales) preserves Eocene fossils of whales and other shoreline marine species and plants which lived in and on the edges of the waters of the Tethys Sea which extended down into the Faiyum area at that time. It's lovely. If you get the chance to visit do go. Wadi Al-Hitan in Egypt’s Western Desert is the only place in the world where the skeletons of families of archaic whales can be seen in their original geological and geographic setting of the shallow nutrient-rich bay of a sea of some 40 million years ago. The fossils and sediments of different periods and levels reveal many millions of years of life and are valuable indications of the palaeoecologic conditions, of Eocene vertebrate and invertebrate life and the evolution of these ancestors of modern whales. Remarkably, two species still had small hind limbs, feet and toes. The quality, abundance, concentration and state of preservation of these fossils is unequalled. This is a fascinating report in PDF format - if you are interested in the subject do have a look. Over 40 million years ago the so-called Tethys Sea reached far south of the existing Mediterranean. This sea gradually retreated north depositing thick sediments of sandstone, limestone and shale, visible in three named rock formations which are visible in Wadi Al-Hitan. The oldest rocks are the Eocene Gehannam Formation, about 40-41 million years old, consisting of white marly limestone and gypseous clay and yielding many skeletons of whales, sirenians (sea-cows), shark teeth, turtles, and crocodilians. A middle layer, the Birket Qarun formation, of sandstone, clays and hard limestone, also yields whale skeletons. The youngest formation is the Qasr El-Sagha formation of late Eocene age, about 39 million years old. It is rich in marine invertebrate fauna, indicating a shallow marine environment. These formations were uplifted from the southwest, creating drainage systems, now buried beneath the sand, which emptied into the sea through mangrove-fringed estuaries and coastal lagoons when the coast was near what is now the Faiyum oasis, c. 37 million years ago. . . .
Three different species of Eocene whales have been identified with certainty at Wadi Al-Hitan. All are basilosaurids, the latest surviving group of archaeocete whales, and the group which are thought to have given rise to modern cetaceans. It seems more than a little self-promoting to mention one of my own websites, but as far as I know it is the most comprehensive site dealing with the subject of the Faiyum in the prehistoric period. The aim of the website was to aggregate all the fragmented information available in academic journals and books and put it all in one convenient place. The geology page has suffered from age and the maps don't load (and need to be re-done anyway) but otherwise it is a fairly comprehensive record of the area in the prehistoric periods. The 7,000-year-old farming-village site includes evidence of domesticated animals and crops—providing a major breakthrough in understanding the enigmatic people of the Neolithic, or late Stone Age, period and their lives long before the appearance of the Egyptian pharaohs. The discoveries were made as a team of Dutch and U.S. archaeologists dug deeper into a previously excavated mound of sand concealing the ancient village in the Faiyum depression, a fertile oasis region about 50 miles (80 kilometers) southwest of Cairo. Just centimeters beneath the modern plowed surface, in an area that had been used until recently to grow grapes, the researchers discovered evidence of structures, such as clay floors, and hearths containing homegrown wheat grain and barley. Also unearthed were the remains of sheep, goats, and pigs—which, along with the grains, were imported from the Middle East. Fine-grained white gypsum or alabaster occurs as a dense network of 25-30 cm-thick sub-vertical cross-cutting veins and was exploited for small vessels, plaster and mortar between the 1 st and 4 th Dynasties (c. 2900 – 2465 BC). The quarries have only been described by Caton-Thompson and Gardner (1934), during their investigations of the Northern Faiyum Desert 70 years ago. The archaeological record comprises three workshop mounds, located approximately 200 m north of the quarries, containing gypsum debris, pottery in the form of beer jars, object ‘blanks' or partially worked vessels and hand-held stone axes. The stone tools are of particular interest as most are of stone not local to the area, in particular, dolerite and Chephren Gneiss sourced 1,000 km south in the Aswan region. Located on the plateau above the workshops is an area of 250 stone circles, thought to be the quarrymen's settlement, yet there is more evidence to suggest that places of habitation were in natural rock-shelters in the overhanging escarpment. The site also bears evidence of one of the oldest infrastructures of road planning in ancient Egypt. A 2.5m-wide and 11km-long road stretching across the area is the oldest and most pristine example of a paved road in the world. It was constructed from flagstones and built to gain easy access to the quarries of Widan Al-Faras and to facilitate the exploitation of its geological resources and the transportation of the basalt blocks. A total of eight quarries are connected by side roads to this long main road, which leads southwards to a quay on the shoreline of Lake Moeris (today's Lake Qarun), the huge body of water at the heart of the Fayoum oasis. When the stone blocks had been extracted from the quarries they were dragged by wooden sledges along the paved road. Once they reached the lake shore, the heavy blocks from the Widan Al-Faras quarries were loaded onto boats which carried them across the lake on a course set for the Bahr Youssef Canal, which ran through a gap in the hills between Hawara and Lahun. The temple remains are in a well-preserved condition, probably due to its isolated location, but are ever threatened by the encroaching sands of the desert. The inner chambers are the oldest part of the structure which is one of the few surviving monuments of the Middle Kingdom, a rare example of architecture from this period. A small columned hall leads to three shrines which contained statues of deities and the two kings. The Dynasty XII reliefs are very worn but it is possible to make out depictions of the pharaohs Amenemhet III and his son and co-regent Amenemhet IV offering to deities in the shrines as well as rare depictons of the cobra-headed goddess Renenutet. The region of el-Faiyum thrived during the Middle Kingdom when the fertile area around Birket Qarun began to be developed as a pleasure-ground in which kings and high officials pursued their sports of hunting, fishing and fowling. It became so popular that the Dynasty XII kings Senwosret II and Amenemhet III chose to site pyramids here as their final resting places, at the far reaches of the existing pyramid fields to the north. Senwosret II's pyramid complex is situated at el-Lahun (sometimes called Illahun) and Amenemhet III's complex is at Hawara on the southern edge of the oasis, just off the Beni Suef to Cairo desert road. 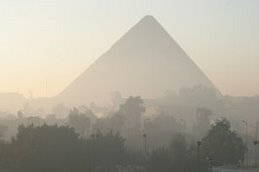 The pyramid itself was built in typical 12th Dynasty fashion with a mudbrick core and a casing of fine white limestone. The entrance to the subterranean levels was located in the actual face of the pyramid on the south side, very near the southeast corner. Within the pyramid, a descending corridor with a stairway first lead north. This corridor, which descends to a lower level then the burial chamber, was sheathed in fine white limestone, continued until reaching a small chamber, and continuing straight leads to a blind dead end. However, the builders used an elaborate device first seen in the Abydos tomb of Senusret III. A second corridor is hidden within the ceiling of the small chamber. It was originally meant to be blocked by a 20 ton quartzite slab. This corridor very shortly arriving at a second chamber. From this chamber, two corridors depart, one north, and another to the east. This project explores the possibility of reproducing a destroyed historic site from its remaining artefacts using VR (virtual reality) technologies. We will build an experimental model for an online reconstruction that allows public users to explore and visualise the range of possible forms of the ancient architecture. The project will focus primarily on the Hawara Labyrinth site, a unique combination of buildings and artefacts from two different eras and cultures: an Egyptian pyramid complex, and Roman period cemeteries.